Hello lovelies, I have been getting Gel nails for I do not know how long, at £40 quid a time plus 'soak off's' it really is getting to be an expensive hobby. However, because i'm a busy mum, running about all over the place, a normal manicure on my nails never last, always chipped at the end of the day. I normally go around like that for ages because knackered-ness gets the better of me at the end of the day. 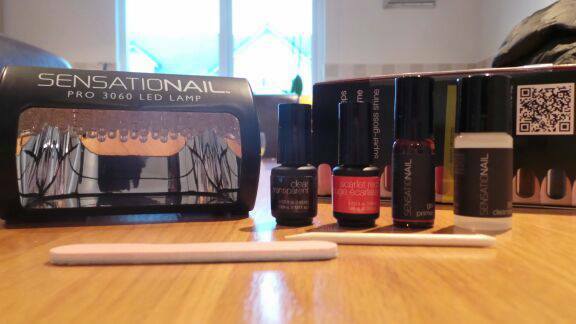 I had been admiring Sensationail Gel Kits for a long time in Boots and the other week there, I decided to bite the bullet and splurge out £69.99 to try the kit out for myself. Well.. the results were phenomenal. I am so impressed by this product and how easy it was to do myself in practically no time at all. Begin like you would with any manicure - trim and buff your nails. 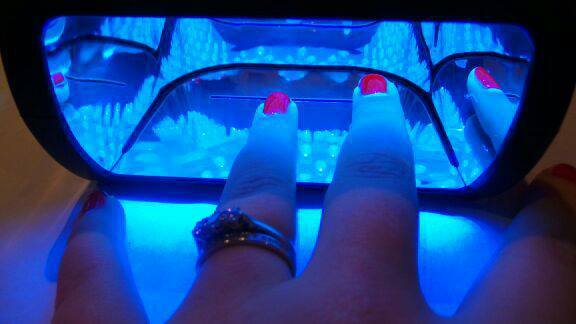 Next prime your nails with the solution provided allowing to air dry for 30 seconds. 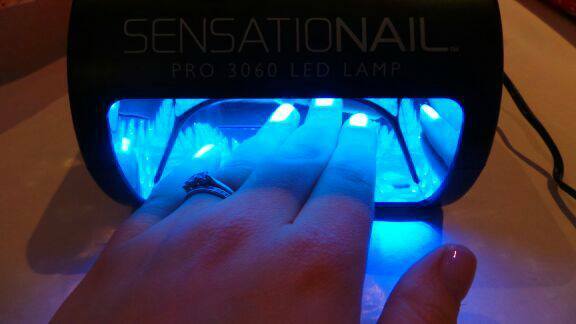 Apply gel base coat and place your hand under the LED light for 30 seconds. I use a 'four finger rule' and do thumbs last. 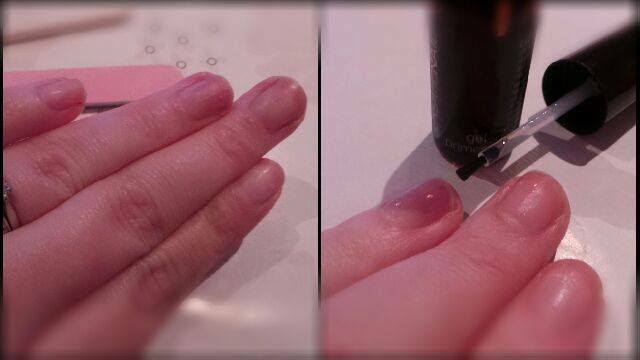 Next apply a thin layer of your gel nail colour - they say you can do another coat if needed, I felt one layer was enough. Run the brush along the tips of your nails to seal. Place under the LED light for 60 seconds. 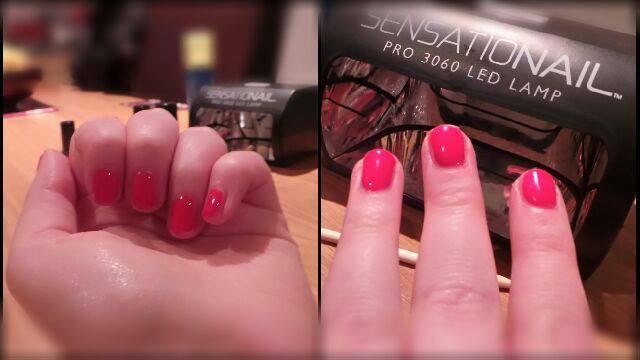 Finally, apply the gel top coat, LED for 30 seconds. Repeat these steps for your thumbs and voila! A perfect gel manicure. I think I did a pretty good job for my first attempt, my left hand looked beautiful. The right hand was a little dodge but it always does when doing my nails myself but still looked pretty good. 5 days in and no chips! I am a bit of a ditz though, I forgot to buy the Remover Kit, remedied this by nipping in to the shops and bought pure Acetone, cotton wool buds and some tin foil. 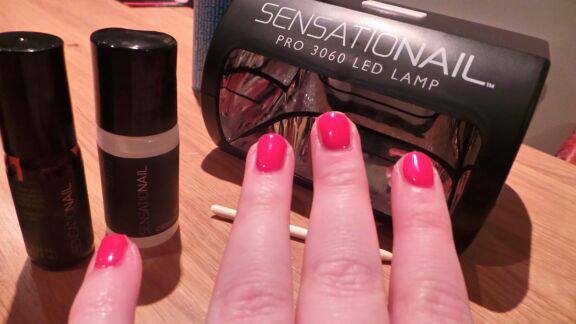 I have since ordered a few more gel shades online, they are £5 cheaper via Amazon. Have you a busy lifestyle? try these. Tried them already - love? I do apologise for the rubbish quality of these pictures, my camera and I had a fall out! They look fab, you did a really good job. This will save a lot of £ in the long run. I would love this! 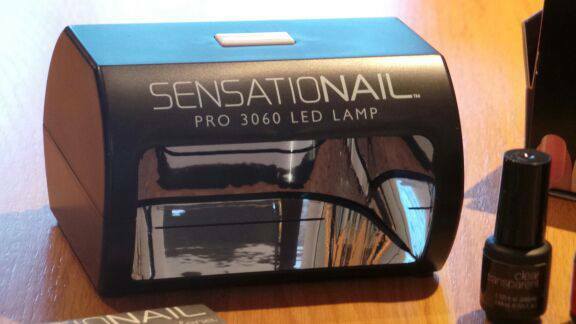 Your nails look fab! They look amazing! It's crazy how much they cost to get done at a salon. Thank you so much for this review. I've been considering getting an at-home gel kit, but I wonder if it would work with regular nail polish too. That looks great! I wish I had known about this earlier! I bought a gel kit like a week or two ago and am waiting for it in the mail. Hopefully it turns out as great as yours did. I reallly want to try this! This looks lovely! I'm so glad you did a review on it, I've been thinking about getting something like this for such a long time. Was nice to actually see it in use! It will be interesting to see how long it will be before it does start to chip. I get my nails done too but like you said it gets expensive! I don't own one but I have tried them & I think they're the best. Wow I need this in my life! Wow your nails look great! !